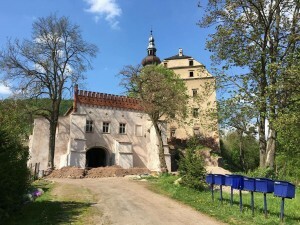 Sarny Castle has been under intensive renovation since December 2013 and needs your help. A charitable trust called Fundacja Odbudowy Dworu Sarny, we bought it from the Polish government in a state of complete ruin. As of January 2018 we’ve raised and spent about $1 million to save the castle. Sarny Castle and its magnificent St. John Nepomucene Chapel need much more if they’re to be saved for future generations. In 2016 our trust received support from the Polish Ministry of Culture. But in order to use it, we had to match an equivalent of $100,000. In 2017 we opened Sarny Castle and its Gatehouse, keeping it available for free daily from 11 a.m. to 8 p.m. In order to be able to keep renovating, we’re asking your help. Even the smallest amount matters a great deal. Please help us save this unique house and its works of art.